15 years after its creation, Investisseurs & Partenaires publishes a short document reflecting on the successes, drawbacks and key lessons learned from its first impact fund: Investisseur & Partenaire pour le Développement (IPDEV). IPDEV was founded in 2002 to contribute to the development of Small and Medium Enterprises in Sub-Saharan Africa. This was a pioneering project at a time when investors showed little interest in African entrepreneurship. In the past 15 years, more than 30 investments and 20 exits in 10 different countries have been effected; IPDEV has met with many successes and some setbacks in a rapidly evolving African context, while contributing to an entrepreneurial revolution occurring on the Continent. 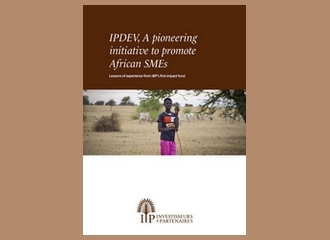 With this document, entitled “IPDEV, a pioneering initiative to promote African SMEs”, I&P shares this unique experience and reflects on 15 key lessons that could prove useful to impact investors willing to support African small businesses. In the first part, we present the history of IPDEV, from its pioneering debut to the diversification of the investment vehicles required to encompass the growing range of its operations. We lay out the key features of IPDEV’s approach which is to bring its skills in management, strategy and finance to support SMEs and help them develop in a sustainable manner and generate high impact. In the second part, we draw 15 key lessons from of our 15 years of investment experience following 3 aspects: the enterprise and its management, the investor strategy and the investor’s operations.